Some yoga poses twist your neck so much, I’ve heard that it could cause a stroke. How much danger of stroke is there? Your concern is understandable—especially when some of the twisting, bending and stretching looks like something the human body wasn’t meant to do! However, twisting poses have not been known to cause strokes, and your risk for stroke from yoga is low…as long as you avoid certain poses and take a few reasonable precautions. The possibility of stroke from yoga first rose to public attention in 2012, when a Pulitzer Prize–winning New York Times reporter, William Broad, published a book called The Science of Yoga. He reported that yoga poses that flex the neck extremely could cause tears in neck arteries…which could cause blood clots to form…and the clots could flow into the brain and cause a stroke. A 2009 survey of more than 1,000 yoga teachers from 34 countries published in International Journal of Yoga Therapy did confirm that the neck was the most common site for injury, including severe injury…followed by the shoulder, back, knees and wrists. And it’s true that a few cases of stroke attributed to yoga poses that extremely flex the neck have been reported—but not many. Between 1969 and 2012 there were three published case reports. With the Shoulder Stand, the whole weight of your body is on your shoulders and the back of your neck, which is forced into an extreme flex position. So, too, with Plow, which extends the stretch of the Shoulder Stand to lower your legs so that your toes touch the ground behind your head. In fact, even seasoned teachers almost always put blankets under the shoulders to make the neck angle less acute. A far more common yoga injury is worsening of glaucoma. Intraocular pressure is already high with glaucoma, and any position that inverts the body—for instance, a Headstand, Shoulder Stand, Standing Forward Bend or Downward-Facing Dog—can increase eye pressure further and injure the optic nerve. Research has found that some inversion poses can cause intraocular pressure to double in just 15 seconds. This is fine for most people, but dangerous for anyone with glaucoma. 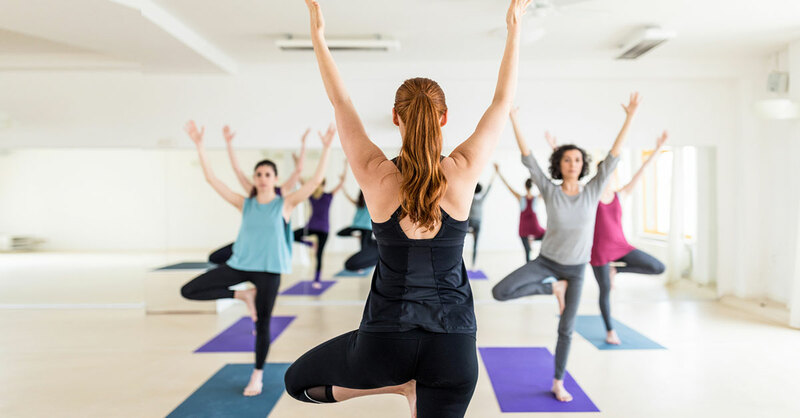 Be sure to let your yoga instructor know if you have glaucoma—or any other any physical or medical issues, including high blood pressure, osteoporosis, disc problems and spinal stenosis. If you have multiple sclerosis (MS), take a pass on Bikram yoga. Room temperature can reach 105ºF, which can trigger an MS flare. Most yoga injuries are sprains and strains, which can be avoided, or risk can at least be minimized, by making sure you have a good teacher and by not going beyond your fitness level and ability. Bottom line: For most people, the advantages of yoga far outweigh the risks of injury. You’re in much greater danger crossing the street!